Ingredients: Rooibos tea 75%, orange peels 10% , oregano 1%, cardamom 2%, hibiscus 5%, dried apples 6%, cinnamon1%. Unflavoured tea! Color: Red – dark orange. Taste: slightly sweet with hint of honey, enriched by natural taste layers of spices and herbs. 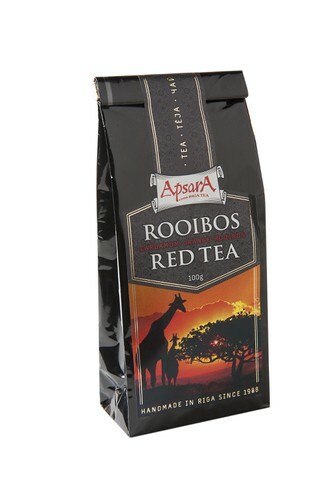 Product highligths: Rooibos tea is well known for it’s antiallergic, anti-stressing properties. As herb tea, it doesn’t contain any coffeine and recommended to people of any age. Expecially good drink before sleep.